The recent CLE activity saw mixed conditions throughout North America. The general consensus was that propagation was just 'OK' but lightning noise continued to be a problem for some beacon hunters. Here in B.C., propagation was fairly flat on all three nights, with Sunday night providing the lowest noise levels. Signals were generally weak and somewhat 'mushy' at times, with propagation still being affected by high speed solar winds and an elevated 'K' index. I was happy to see that 'LU' near Abbotsford, B.C. and pictured in the last blog, was well heard. Reports of the mountain-meadow beacon came from Hawaii in the west to Illinois in the east and everywhere in between. The logs / reports from all participants may be viewed here on the NDB List website. As luck would have it, the three nights following the CLE have been fantastic on MF which seems to happen all to often. This coming weekend will see another monthly CLE challenge. This time the hunting grounds will be: 190 - 239.9 kHz PLUS normal NDBs on 'half-way' frequencies nnn.5 kHz (from 190.5 - 999.5 kHz). A nice challenge in this one is to hear the Abbotsford (BC) NDB, 'LU', on 214 kHz. This is the beacon associated with Abbotsford Int'l Airport, Vancouver International's alternate for foggy conditions. It is located in a breathtaking mountain meadow location at the foot of the North Cascade Mountains. It's 500W Nautel drives a 100' vertical and with all of that space, I suspect a very robust ground system. 'LU' gets out very well and has been heard from Hawaii to New England and should be a good propagation indicator for many North American participants. 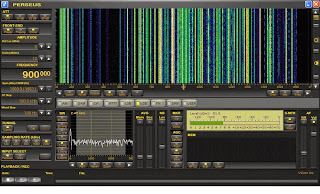 Look for 'LU's upper-sideband CW identifier, repeated every 10.4 seconds, on 214.404 kHz with your receiver in the CW mode. 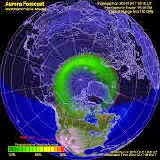 Usually November provides some excellent propagation as the summer thunderstorms have pretty much run their course but the recent warning of upcoming geomagnetic activity may, once again, mean something else in store for us. Often these 'warnings' are not as dire as they might appear and MF propagation remains robust or even enhanced. listening and opportunities to catch some good DX. This should be ideal to try out a CLE for the first time. 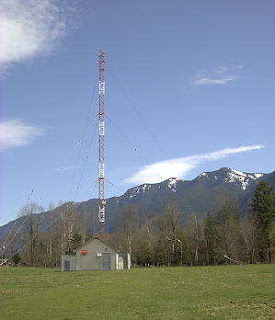 the NDBs whose published frequencies are lower than 240 kHz. 'Normal' NDBs - no DGPS, please. # The date (or just the day 'dd') and UTC (days change at 00:00 UTC). # kHz - the beacon's nominal frequency. details such as Location, Distance, etc. go LATER in the same line. - and old ones with memories like mine! Also, please ALWAYS send your last log with ‘FINAL’ in the subject. 'half-way' frequencies include them in your main list of course. with a list to let you check that your log has been found OK.
Joachim will again be making the combined results for us. by 09:00 UTC on Wednesday 29 November. stating the location and owner – and with their permission if required. to make further loggings for the same CLE. For the past year, as interest in the digital modes began to skyrocket, I have been reading the topical discussions and questions posted in the WSJT Yahoo Group. Since the introduction of FT8, the group's daily traffic has soared and easily occupies the vast majority of inquiry. Far and away, most questions either involve software / computer configuration problems or inquiries involving the operational use of the software itself. I am often surprised at the range of inquiry and in almost all questions involving the software itself, it just comes down to 'reading the manual' ... it seems that hams, like so many others, just don't like to read manuals and for a technically-oriented hobby, I find this peculiar. Perhaps it's because I'm just the opposite, and will usually go over instructional material, more than once, before plugging something in or installing any new software. 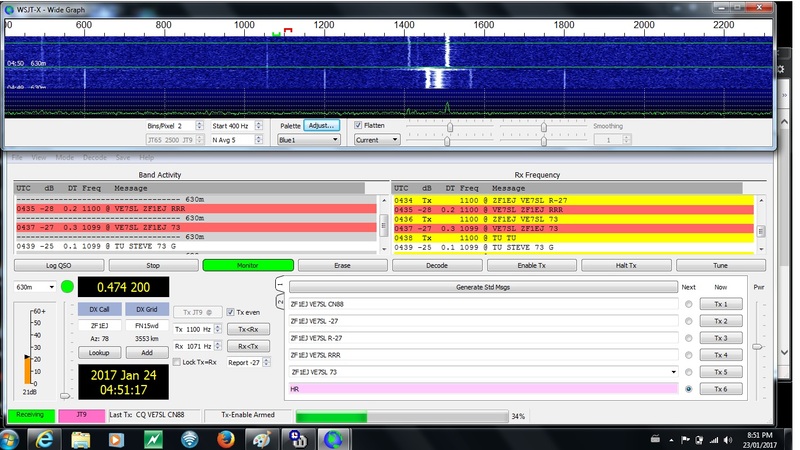 I have been using JT65 and FT8 a lot, mainly on 6m DX to receive weak signals in the noise floor. QSB is acting fast there and the 15s intervals are a major advantage of FT8 to be able to complete rare contacts. But which algorithm is better to decode weak signals in theory and practice? Do the long intervals allow the JT65 algorithm to decode weaker signals than FT8? If both modes are equivalent is there any reason to use JT65 rather than FT8? ... simple answer, neither wins in all situations. Each mode in WSJT-X is designed for a certain set of requirements and given those the protocol and the decoders try to optimize sensitivity and robustness. JT65 was designed initially for EME where ultimate sensitivity was necessary and one minute T/R periods with variable bandwidths between 180Hz up to 400Hz, to cope with Doppler spreading, was deemed acceptable for practical QSOs. FT8 is not as sensitive, a few dB behind JT65A but as you point out it is particularly suitable for multi-hop 6m Es propagation where openings can be very short. This is no surprise as it was crafted for exactly that. OTOH FT8 has become *very* popular on HF, probably because most HF QSOs do not need ultimate sensitivity and the 15s T/R period makes QSOs four times as fast compared with JT65. This last attribute is surely what is driving the massive uptake on HF on the current "easy DX" propagation bands like 20m for daylight paths and 40m for darkness paths. JT9 was designed for HF and uses about 1/10 of the bandwidth of JT65A along with even better sensitivity. Unfortunately many users use ancient software with no JT9 support or are working through JT65 goals like WAS mode specific endorsements so JT9 does not get the attention it deserves. Although JT9 works for many on 6m, the tighter frequency tolerance required is a limitation for many with older rigs. Both FT8 and JT65A have two pass decoders that can dig out multiple overlapping signals (similar techniques could be developed for JT9 but the need has not been seen yet). FT8 has the AP decoder which gets a couple of dB extra sensitivity for critical decodes and also helps with truncated or interrupted messages in some cases. WSPR is a pseudo beacon mode that uses a short message and two minute T/R period that has greater sensitivity than even JT9 despite the signal being only 6Hz wide. WSPR like JT65A and FT8 uses a two pass decoder capable of decoding overlapping signals. There is also MSK144, QRA64, JT4, the fast versions of JT9, ISCAT, FreqCal and Echo mode. Each with a specific purpose and maybe for other opportunities they were not initially designed for. For myself, I have yet to download the latest WSJT-X release, as I presently have no need, nor see the need to use FT8. To utilize the new release, I think I'll need to delete my older (pre-FT8) version, in order to avoid file confliction problems. My older version works very well for what I do need, and that is JT9. There are a few features on the software that I also find handy, which have been removed in the newer versions ... I think. I can however, visualize losing out on some great DX opportunities on 6m during the summer, if the huge exodus from the CW DX mode to the FT8 mode continues to escalate. I really hate the idea of this happening but if that's what it takes, I'll install the FT8 version on my small contest-logging laptop which means building a new interface to run the 756PROIII on FT8. Of course there is always the possibility that the trend will reverse as many eventually find that FT8 contacts are not all that interesting. 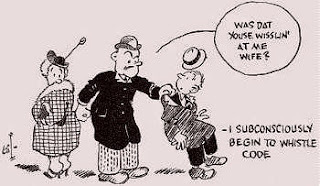 The inability to exchange anything other than minimal required QSO information is the price paid for that extra sensitivity ... fine for that once in awhile new one in the log but not very satisfying for everyday communications. In my opinion it is nice to see a steady return to JT65 & JT9. An all round better mode. Still a bit short on the DX stations but I am sure they will follow soon. Pretty much what a lot of us said would happen: an initial surge to FT8 and then things would settle down. Just another tool in the toolbox that does not have to be “better” or “worse” than anything else that has a few advantages over some modes in some areas (Es, for example) and disadvantages over others. None of these modes has to be classified as “good,” “bad,” “better,” “worse,” etc just like I don’t consider a screwdriver “better” overall than a hammer but each tool does a different thing. I suppose it’s human nature to attempt to classify things that way. I have also seen some confusion when some are describing WSPR 'QSOs'. This is disturbing since there can never be a two-way exchange of information, all via radio (a QSO) using the one-way WSPR beacon-mode. Some may be confusing 'WSPR QSO's' for the actual Weak-Signal two-way 'WSPR QSO' modes such as JT65, JT9, FT8 etc. Since WSPR relies on an internet back-channel exchange of information (to see where you've been heard), there is no actual on-air exchange of the data needed to claim a legitimate contact. To make such a claim would be no different than two stations, each running a beacon and calling each other up on the telephone to say that they can hear each other and calling it a two-way 'QSO'! I have been using, and will continue to use JT9 on the new 630m band where signal levels are often too marginal for CW work but easily handled with this digital QSO mode ... otherwise I'll keep pounding brass whenever I can! Back when I first got on the air there were very few amateurs using keyers. Most used bugs and the remainder used hand keys. It was very easy to tune across the band and identify any of the locals just by the sound of their fist ... like snowflakes, no two were the same. The same went for most stations that were very active. DX or otherwise, one could usually tell who it was, long before the callsigns were sent. 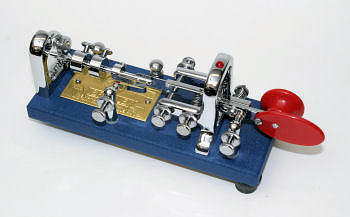 The Samuel F. Morse Amateur Radio Club, a Sacramento, California based CW enthusiast club wanted a special time to bring bug operators together on the air. In the same spirit as ARRL's Straight Key Night, participants are encouraged to make simple, conversational, “chewing-the-fat” QSOs using their bug type key. This is an opportunity to exercise, share and exhibit your personalized fist. This is NOT a contest. However, there is a very easy and quick required signup form found at https://w6sfm.com/bug-roundup/. Once you are registered for the event simply call "CQ BR" so folks know you are a Bug Roundup Participant. So lets grab that bug, clean those contacts, and let’er fly! We want to hear that “Banana Boat / Lake Erie Swing" or that commercial KPH/WCC quality fist. Reserve the date! The event begins on Friday November 17th (00:00 UTC) and concludes Sunday Nov. 19th (23:59 UTC), 2017. Sounds like a fun event and I'll have a tough job deciding on which bug to use but it'll probably be the Blue Racer once again. Please be sure to register for the event and see if you can squeeze-in a few hours of nice old bug-generated CW! 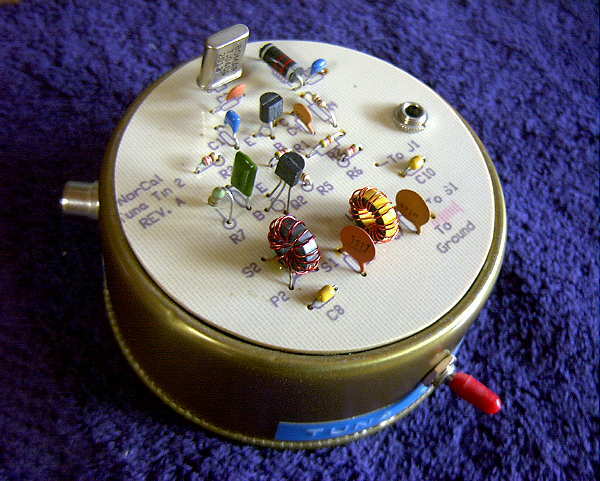 Several years ago, like many other hams, I was stricken with 'Tuna Tin fever' and purchased a Tuna Tin II kit from the Norcal QRP group. Escaping the summer heat a few months later, I put it together over one weekend in July. As it turned out, it was probably the best $13 I ever spent on my hobby. I fired it up the next morning and put out my first 250mW 'CQ' on the 7040 KHz 40m QRP calling frequency. Back then, 7040 was ground-zero for forty meter QRP fanatics and there always seemed to be folks monitoring while working at the bench on their latest project. Given the time of day and the mid-summer propagation, I really didn't have high hopes but I was immediately answered by KJ7AN in Dallas, Oregon who gave me a 579 report! Over the next three days I worked several more stations in Oregon, Washington, Idaho and even California. I was truly delighted with the little rig's performance but assumed that my pint-sized signal would probably not go much farther than the nearby western states and maybe, if I was very lucky, a few more Californians. All that changed early on the morning of August 6th! About an hour after sunrise, my tentative hand-keyed 'CQ' was answered by Steve, NØTU in Colorado!! Steve had been enjoying his morning coffee while the quiet hiss of 7040 in the background was broken with my very weak 'CQ'. We had a good solid QSO and after it was over, I realized that the little Tin had a lot more potential than I had realized. It seemed to me that if my little signal could skip all the way to Colorado in August, then it should go a LOT further during the winter DX season ... perhaps far enough to work all fifty states? It was at that point that I decided to give it a try. I re-pruned my 40m half-sloper as well as adding 35 buried radials and as the fall DX season approached, I watched 7040 every weekend ... the new states soon began piling up. To shorten the story, in early December of that winter, I worked WG7Y in Wyoming for state #50 to claim the first-ever Tuna Tin 'Worked All States' ... all on 7040 KHz. Unfortunately the ARRL does not have any special endorsements for Tuna Tins but they did stamp my 'WAS' certificate with a 'QRP' notation! 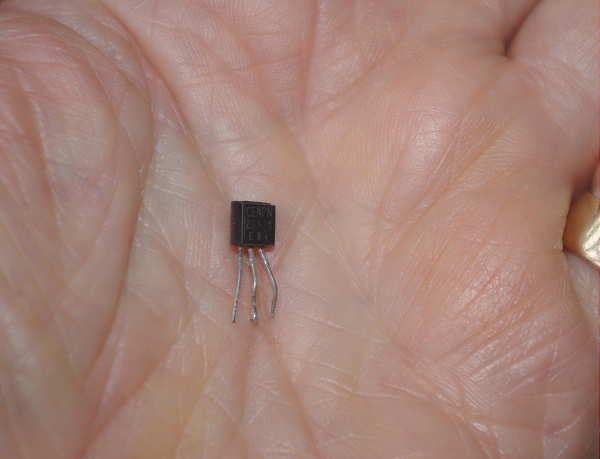 At some point in the intervening years, the little Tin's final amplifier, the ubiquitous 2N2222, went south. As I removed and examined the tiny old battle-scarred soldier, I remembered so many hours of late-night pleasure it had brought me, along with some memorable sessions ... one being a snowy late Friday night opening to the east coast that put the last three needed New England states into my log in less than thirty-minutes. 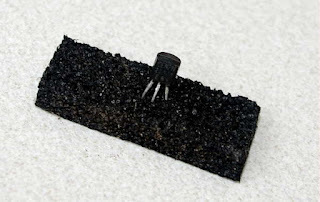 I carefully placed the little transistor in a piece of anti-static foam, not that it needed protection, but as a keepsake and a reminder of its noble past. Possibly I would mount it on a nice hardwood base in the future. Earlier this year I noticed, when cleaning the shack, that the little black keepsake could not be located ... I figured that it must have got sucked-up in the shop-vac during one of my rare shop clean-up days. I always empty the shop-vac, which consists mostly of fine sawdust or wood shavings, onto my large pile of lawn-mower clippings, which seems to stay about three-feet high no matter how much I keep adding. Emptying the grass catcher last week, during the final mowing of the season, a small black object sticking out from mid-pile caught my eye. It was indeed my old friend and, after reaching out to 50 states, she still had enough left for one last call to me! I'll take much better care of her now and keep her in a safe place, away from the nasty shop-vac. I eventually went on to build a 20m Tuna Tin, also crystal-controlled on which, at last check, had brought 46 states and a DXCC total of 21 countries. This inspired a 'mini-tuna', built into a small cat-food tin and using just a barebones 2N2222 crystal oscillator. This one has brought 33 states over the years. I have more Tuna Tin info, along with circuit information on my main web site here ... but be warned -- 'Tuna Tin fever' can strike anywhere at anytime.